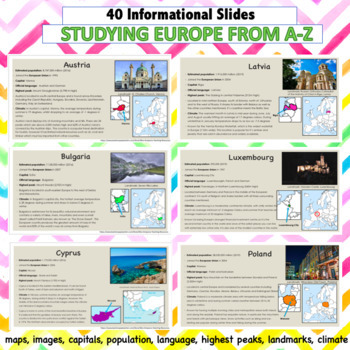 This resource will focus on each countries: population, date joined the EU, capital city, official language, highest peak, location, climate, special features and significant landmarks within the area. The maps and diagrams will help students develop strong understandings about where each country is located within the world. Reflection questions can be found at the end of the informational slides to check student understandings about the European Union and the countries involved. From the 40 informational slides, students will learn about how many countries make up the European Union, the meaning of a continent/ transcontinental area, the land prior to division (Yugoslavia), the benefits and consequences of the European Union, knowledge of what each national flag looks like, man-made and natural landmarks, neighbouring countries of Europe and its countries within. A seperate TEACHERS ANSWERS sheet is provided for easy marking! The informational slides compliment the worksheet activities and reflection questions. 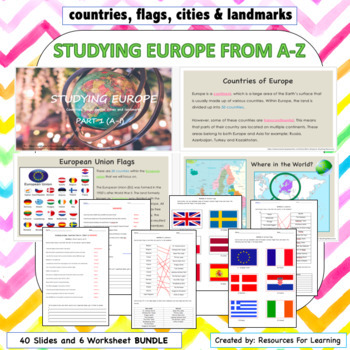 Overall, a fantastic resource for history and geography to learn about Europe. 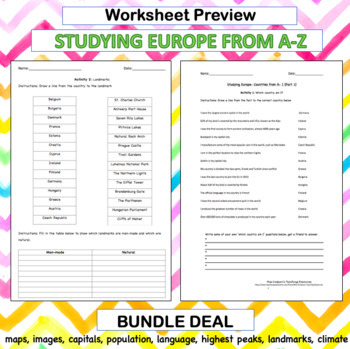 Please note, this BUNDLE DEAL includes part 1 and 2 of the 'Studying Europe Resource' which is normally $3.50 each. Therefore, you will save $1.50 by downloading this package now.